Adam Foley, Kent, Ohio; history graduate student — study and research grant to Italy. Erin Hattler, Denver; anthropology and German, Class of 2014 — English Teaching Assistantship to Germany. 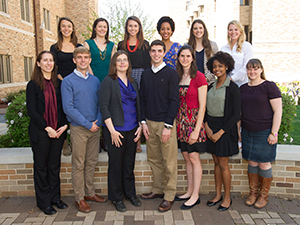 Six Notre Dame students have also been awarded with national fellowships. Vienna Wagner, a 2015 graduate in English and Carmel, Indiana, native, was awarded a Beinecke Scholarship, which enables promising young scholars to pursue a graduate education in the arts, humanities and social sciences. Michael Dinh, a Maricopa, Arizona, native and 2016 graduate studying biological sciences and psychology and a member of the Glynn Family Honors Program, and Jacob Haley, a Murfreesboro, Tennessee, native and 2015 graduate in mathematics and economics, were each awarded a Goldwater Scholarship. This scholarship, honoring Sen. Barry Goldwater, is designed to encourage outstanding students to pursue careers in mathematics, natural sciences and engineering. Three Class of 2015 undergraduate students were awarded with National Science Foundation Graduate Research Fellowships, which provide funding for research-based study leading to a master’s or doctoral degree in STEM fields. Recipients include Ashley Armstrong, mechanical engineering, Flossmoor, Illinois; Patrick Marino, mechanical engineering and physics, Birmingham, Alabama; and Annie Stephenson, physics, Guymon, Oklahoma. Applications for Fulbright and other national scholarships and fellowships are administered by CUSE and the Graduate School Office of Grants and Fellowships. CUSE provides undergraduate students in all the University’s colleges opportunities for research, scholarship and creative projects. More information on the offices is available at cuse.nd.edu and graduateschool.nd.edu. Originally published by Notre Dame News at news.nd.edu on July 24, 2015.